Description: Mount Bailey stands at 8368 feet, but with the jagged peak of Mount Thielsen nearby, it often gets overlooked. However, this summit trail does not require climbing skills and boasts beautiful views of Mount Thielsen’s pointy spire. 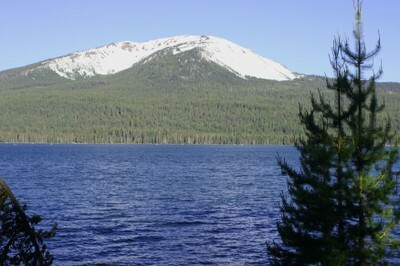 Views of Crater Lake and Mount Shasta are visible to the south along with Three Sisters and Diamond Peak to the north. Views of Diamond Lake and Crater Lake National Park are also visible. During the winter portions of the area are reserved for cross country skiing while other portions are over run with snowmobiles. Directions: Coming from Roseburg, take Highway 138 east for about 80 miles. Then turn right onto Highway 230, take the Diamond Lake Recreation Area turnoff and drive to the South Shore Picnic Area sign. Turn left onto Road 4795, 1.7 miles past Silent Creek to Road 300. Turn left and go to the parking area .4 miles away. For a shorter hike, access the trail via the upper road. This can be accessed by taking Road 3703, 3 miles west of the Diamond Lake turnoff on Highway 230. Continue on Road 3703 for 2 miles to Road 300. Then turn right and continue .1 mile to a left turn on Road 380, which is quite rough. This road requires high clearance as there are large rocks. Continue up Road 380 for 1.5 miles to trail.